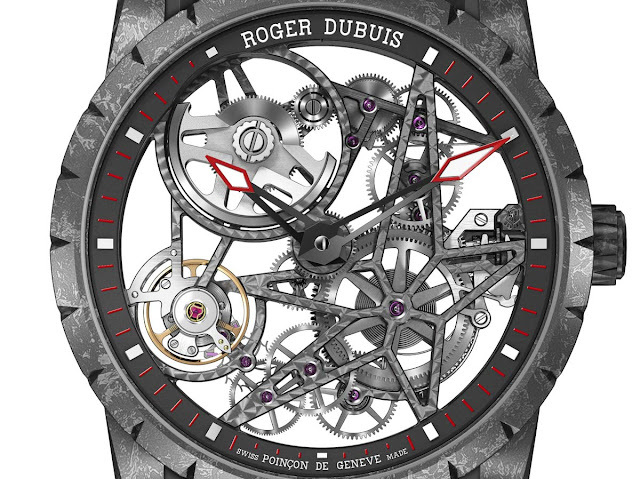 First presented at the SIHH 2015, the Excalibur Automatic Skeleton was Roger Dubuis’ first non-tourbillon skeleton timepiece and was equipped with its first skeletonized automatic movement. 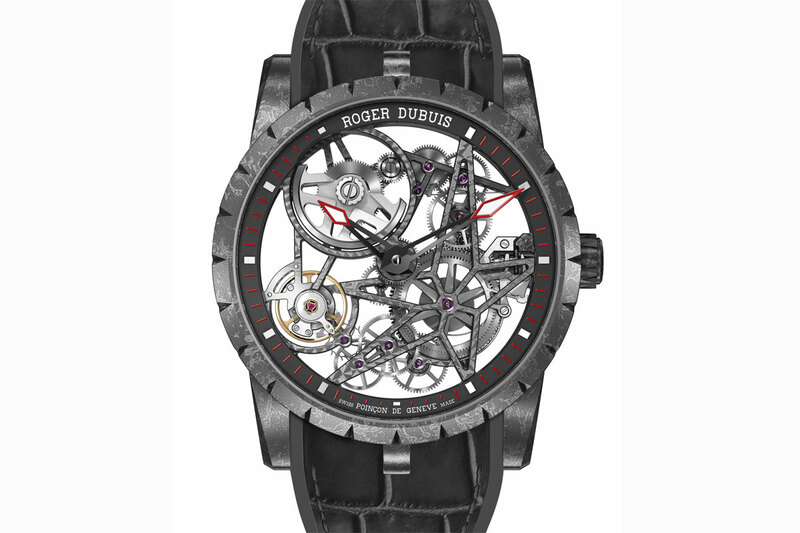 In 2016, Roger Dubuis is now presenting the Excalibur Automatic Skeleton Carbon, featuring a new case that was crafted using a high-tech composite known as carbon fibre sheet moulding compound (SMC) which is twice as light and twice as hard as steel. enables excellent part reproducibility and, above all, the possibility of creating components with complex shapes and integrated functions. SMC is produced by compressing carbon fibres with resin and steel moulded at extremely high temperatures, which is then reworked and compounded with resin. The resulting technical look is ideal for an avant-garde sporty timepiece. The 42 mm x 12.14 mm case frames a skeleton dial with black flange, red minute-circle, white gold appliques and skeleton hands in gold. power equivalent to that of a central rotor. Guaranteed power reserve is 60 hours. 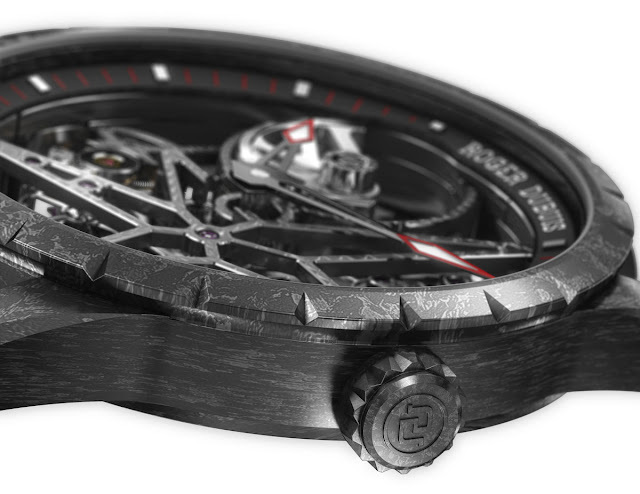 with the stringent requirements of the Poinçon de Genève certification. 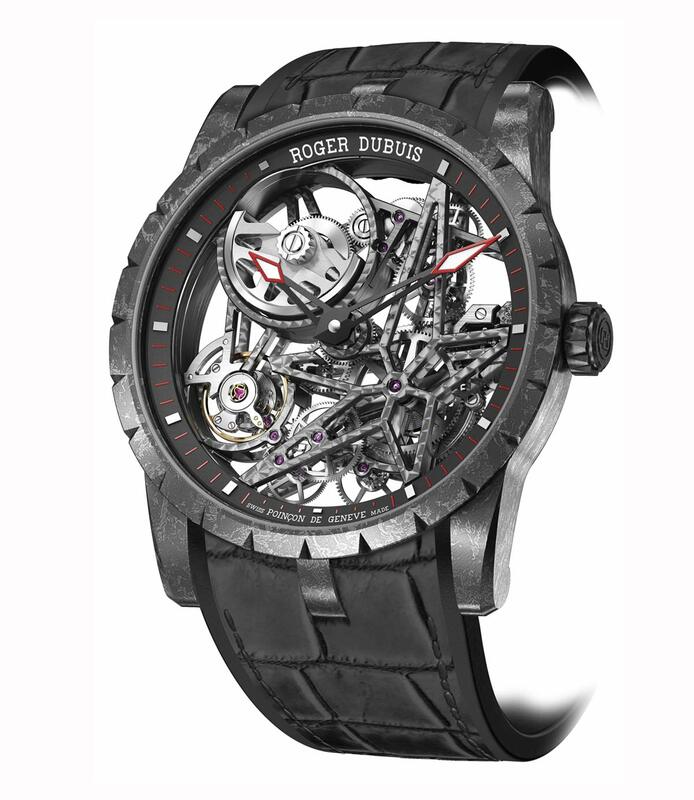 SIHH 2016: Roger Dubuis Excalibur Automatic Skeleton Carbon. First presented at the SIHH 2015, the Excalibur Automatic Skeleton was Roger Dubuis’ first non-tourbillon skeleton timepiece being equipped with its first skeletonised automatic movement. In 2016, Roger Dubuis is now presenting the Excalibur Automatic Skeleton Carbon, a new version whose case was crafted using a high-tech composite known as carbon fibre sheet moulding compound (SMC). Price to be announced at SIHH 2016.